Wednesday, the Federal Communications Commission released their final proposal for ending what’s known as net neutrality. 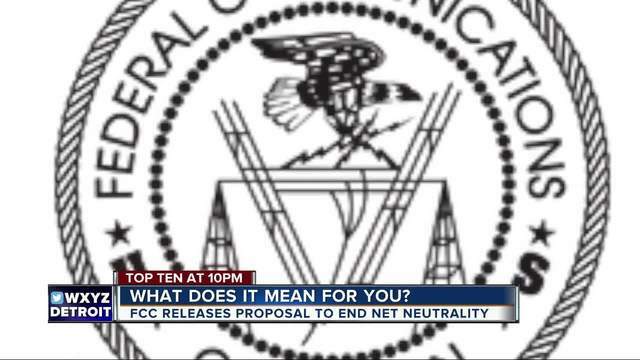 The FCC will vote on the plan on December 14. The phrase has been buzzing around the internet, but not everyone knows what it means. 7 Action News looked for industry experts and professors to help break it down. Amanda Lotz is a Professor of Communications at the University of Michigan. "Basically the idea of net neutrality is pieces of content can travel over the internet the same way,” said Lotz. The FCC has released the plan to do away with it and that would mean internet service providers have more control over speeds and the content. In the same way people pay a bill for internet every month, internet service providers could charge content providers. Websites, like Google, Facebook, Netflix could all be impacted. "The internet service providers also want to be able to charge these companies that use the internet to ‘use’ the internet,” said Lotz. "Those companies, many of them don't have those extra fees built in to their prices of the goods so we as consumers will probably end up paying more for those products and more to use the internet,” said Lotz. It could also mean slower or even at times, blocked content, if internet providers decide. Net neutrality is what prohibits that currently. Associate Professor of Computer Science and Engineering, Harsha Mahyastha has been researching the issue. He said there are some instances where there could be benefits to doing away with net neutrality, instances where certain content providers should have more bandwidth, such as emergencies, or health care situations. "There are certain cases where you want the internet to differentiate between certain kinds of traffic,” said Mahyastha. He said he is split on the issue. "Is it going to lead to more market competition like the current FCC commissioner envisions? Or is it going to hurt long term innovation?” said Mahyastha. "The best thing you can do is continue to educate yourself on this issue and have these discussion around Thanksgiving tables this season,” said Lotz. You can find more information here on the FCC’s website, where you can ask questions or file complaints.